Backstory's examination of honor throughout history includes an interview segment about my great-aunt Frances's story, told in Unto The Daughters: The Legacy of an Honor Killing in a Sicilian-American Family. While much has been written about male honor --as settled in duels, on the battlefield, etc. -- not much has been written about female honor. Typically, a female's honor is intrinsically bound up in the honor of her father, husband, brothers, and still is the impetus for honor killings in many corners of the world. Listen in as I discuss the many facets of honor at play in the story of my great-aunt's murder with Joanne Freeman, Yale professor of history and American studies. Backstory is a weekly podcast that uses current events in the United States to take a deep dive into the American past. Hosted by noted U.S. historians, BackStory is made possible through the Virginia Foundation for the Humanities and has ranked in the Top 10 of the iTunes Society and Culture list and as high as #10 among all iTunes podcasts. The full podcast can be accessed at the Backstory website here. Listen in on a lively conversation about the writing life with Karen Tintori, Jill Gregory and the delightful host of Authors on the Air, Pam Stack. 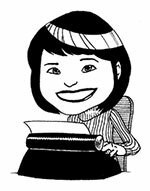 You can access our 2016 Authors on the Air broadcast, archived here. 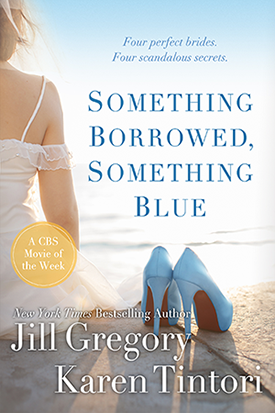 Something Borrowed, Something Blue -- Now in Ebook! Four glamoruous women. Four perfect brides. Four deadly secrets. When Perfect Bride magazine editor Monique D'Arcy decides to showcase three celebrity brides--including herself--plus one lucky Cinderella bride picked from the audience of the Oprah Winfrey Show, none of them can fathom the danger Monique's plan will pose to their upcoming marriages--or to their lives. For these four stunning and happy brides--all ready to say "I Do"--are all hiding secrets that could destroy their hopes and dreams for the future. As their fairy tale weddings draw near, will all four brides make it down the aisle to their happily ever afters? Magazine editor Monique D'Arcy has built both her career and her relationship with her fiance on a lie--lovely fashion model Eve is being menaced by a relentless stalker-- gorgeous actress Ana Cates, engaged to a handsome U.S. Senator, is desperate to keep her shameful past from catching up to her--and sweet, hardworking manicurist, Teri, engaged to the nicest guy in the world, must outrun a heartbreaking truth that could destroy all her dreams of happiness. Excerpted in Cosmopolitan magazine, adapted by CBS for a TV Movie of the Week starring Connie Sellecca, Twiggy, Dina Merrill, Brett Cullen, Ron Howard, Paull Goldin and Shawnee Smith, and nominated for a Romantic Times Reviewers' Choice Award, Something Borrowed, Something Blue was originally published in hardcover by Doubleday and in softcover by Bantam Books. Foreign rights sold in hardcover and softcover to the U.K., and in softcover to Korea, Russia and France. Also published in large print edition. As research for their actress character Ana, we spent five days in wintry Toronto, Canada, working as extras in the movie Used People starring Shirley MacLaine, Marcello Mastroianni, Kathy Bates, Jessica Tandy and Marcia Gay Harden, and edited by Karen's brother, John Tintori. You can catch them in the wedding reception scene, wearing poufy '60s hair and white eye shadow rimmed with thick black eyeliner--if you don't blink. Check back for a report on what it's like to be in the movies from the other end of the camera! Meantime, happy reading. 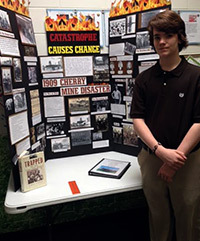 Mega congratulations to Clark Burch-Woodard, who took his eighth-grade Illinois History Fair project on the 1909 Cherry Mine disaster from the fair at St. Walter School in Chicago, on up the ranks to City, and then on to State level, where Clark won a superior ribbon and a top exhibit award. His outstanding project was later displayed at the Abraham Lincoln Presidential Library in Springfield, IL. It is currently on display until the beginning of August, 2015, at The Newberry -- Chicago's independent research library, located at 60 W. Walton. Clark interviewed me about the disaster early in 2015, and we remained in close contact as he expanded his research, amping up his exhibit with each pass to the next level of competition. 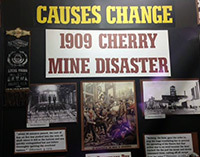 He was so thoroughly invested in his project that Clark even made a trip to Cherry with his mother and grandmother, visiting the library, the miners' cemetery, and the monument dedicated to the 259 men and boys who perished in the worst coal mine fire in US history. Once Clark advanced to State level, I connected him with Springfield's Jack Rooney, who grew up in Cherry, and who also heard the stories of an Italian immigrant grandfather who survived the disaster and, like I did, became hooked. I couldn't be in Springfield to cheer Clark on, but Jack was a fine stand-in, even loaning Clark a miner's lamp, Cherry memorial ribbon and several other items from his own extensive collection of Cherry Mine artifacts to enhance his winning display. "So many people said that this should be a movie!" Clark emphasized -- and I couldn't agree more. Screenwriter Martin Garner has written a brilliant script based on my book Trapped: The 1909 Cherry Mine Disaster, and I'm convinced that this riveting and historically-significant story will one day reach a wider audience, coming to life on the big screen.